Poe has been popping up in pop culture a lot lately. I can’t say that interest in Poe has ever flagged. There are a number of us in the background who are avid fans of him. But the fact that the masses are at last interested in him again is certainly a surprise, particularly because the people in charge keep getting it all wrong. For me, as many of you know, Poe has been a fuel source, a mentor of language, and my frame of reference for discussing the concept of beauty for many years. I am currently working on a short story inspired by Poe’s language and the detective genre of which he is the progenitor. My entire Master’s degree is wrapped up in his theories. Yes the show seems to have some mildly intriguing plot turns, but my concern here is the handling of Poe himself and of his constructs. The first place to start would be to rectify the mistakes the show has made in discussing what Poe believes to be art. While in the classroom, Carroll tells a room of students that Poe’s principle is “insanity as art.” I suppose this makes sense for the way that the show works. But frankly, this is just all wrong. If Poe was obsessed with anything, it was beauty and melancholy and that was only in his poetry, not his prose work. In his prose, Poe dissects the idea of the “art” of murder. Instead of focusing on this, the show focuses on disturbing people with lots of blood and gore, specifically murdering young college-aged girls. They seem to be attempting to cross his view of poetry with his view of prose here. But that’s just a guess. The beautiful women whose deaths are mourned more often appear in his poems, less frequently in his stories. Poe laments the death of the beautiful woman while “The Following” gleefully slashes her throat and stabs screwdrivers through her head. For Poe and his murderous narrators, there is a particular and very significant artistry to the murders they commit. There is a craft to them which one must decipher beneath the horrendous acts. Look at “The Black Cat” and “The Tell-Tale Heart.” Both murderers hide the bodies of their victims in the wall and in the floor respectively. To seal up these holes and make it look like nothing has changed takes great skill. The narrator of “The Tell-Tale Heart” takes pride in the fact that there was no mess left behind. In these actions, the narrators are showcasing their skills as artists or craftsmen. And yes I know how weird that is. But it doesn’t make it any less true. In “The Following,” as you well know if you’ve watched it, bodies are left splayed out and dripping to shock viewers and the characters in the story and the word “Nevermore” is written in blood on a white wall all because the lead serial killer views Poe as his “hero.” They don’t even try to hide the murderous deeds. 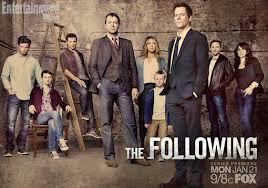 And the fact of the matter is, “The Following” has used up the most recognizable pieces of each of these stories in the first episode. How are they going to keep up this Poe facade for the common viewer? We’ll just have to wait and see I guess. But part of me anticipates a lot of “Nevermore” references written a la The Shining on the walls. It may be a little early to dissect the character of Joe Carroll. But I see little connection to the characters from Poe’s many stories. For Poe’s narrators, there is a war that goes on beneath their surfaces. It is a war between what is human and what is not; what is sane and what is insane. It is the knowledge of what is right versus the drive to do what is wrong. Poe constantly plays with the boundaries of sanity in his work because the concept of insanity was of huge importance and of great debate at the time he was writing. “The Following” invokes Poe as a thinly veiled excuse to exhibit violence without motive. If the writers and producers have ever read Poe, I suppose they haven’t read into his work deeply enough to find the motive and to understand the concepts that he professes. Thus, you end up with a slasher-esque product that tries to play itself off as sophisticated by paying verbal homage to one of America’s greatest writers. But really, if the show has any true connection to Poe, it is simply a neophyte’s dissection of him and his work and a ghastly representation of the genius of this great American author. Poe is definitely misunderstood. He had tremendous amounts of tragedy in his life which is reflected in his writing. He loved women and all those who were significant to him were taken from him, mainly through illness, not murder. Too bad they are exploiting Poe so wrongly. I agree. The tragedy is what fueled his writing. And there is so much beauty in what he wrote too. Even in the gory stuff, there is beauty to be found. I know that sounds weird. But the beauty of the language he uses is what I love most. From what I’ve read he had quite a sense of humor. When The Raven came out children would run up to him and tease him and he would turn and give a bit of a chase crying, “Nevermore!” He also liked to play leap frog with his young cousin/wife. These tidbits don’t come up very often. Poe definitely needed a better PR guy. Yes, Virginia used to call him Eddie, and I guess one day he ripped his pants. I need to find that bit of research again so my students realize Poe had a whole nother side to him. He really is a fascinating literary personality.